Solar inverter fails within four years! I haven’t blogged about the the East-west split solar system for some time. As far as I know it had been doing very well and running without problems. This was until last week when I learnt that the SolarEdge inverter had stopped working. After checking the display panel we found that it was showing ‘Error Code 26’ – a faulty AC relay. We checked the manual and it appears that this is caused when the AC relay fails during the wake-up test and that we should contact SolarEdge support. Although we were expecting an inverter to last a lot longer than just four years, we were very pleased that the inverter and initial installation was still under warranty. 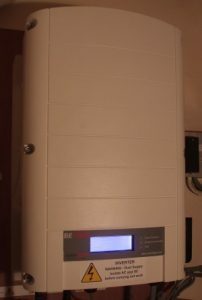 The installation company ordered a replacement and installed the unit within 7-days. It would have cost around eight hundred pounds if the inverter was not within warranty. I can’t help now thinking about how many inverters we will get through before the systems pay for themselves! Previous story Solar Panels – Are they worth it?